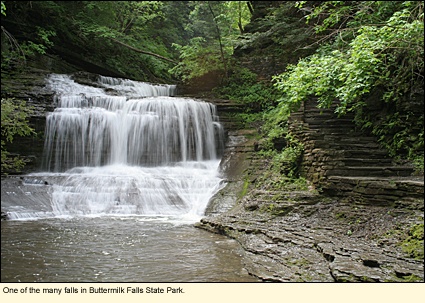 Buttermilk Falls State Park takes its name from the foaming cascade formed by Buttermilk Creek as it flows 500 ft./152.4 m. down a steep sandstone and shale gorge toward Cayuga Lake. 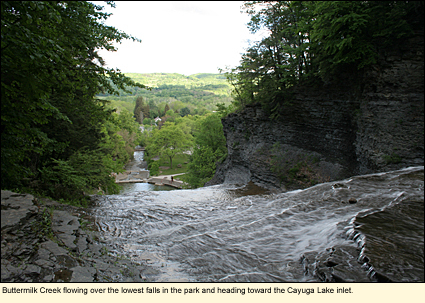 Along the way, the elevation drops from 1000 ft./304.8 m. to 400 ft./122 m. Consequently, if you decide to walk the Gorge Trail and begin at the bottom of the falls, as many people do, you will have to climb those 600 ft./182.8 m.
One of the most popular parks in the region, the 792-acre park in the Town of Ithaca in Tompkins County is divided in two parts--upper and lower Buttermilk--by West King Road. There is an entrance and parking at each part. Upper Buttermilk has a lovely trail--Bear Trail--through a moist woods flush with native wildflowers, a small lake--Lake Treman-- two water falls, and two picnic areas. 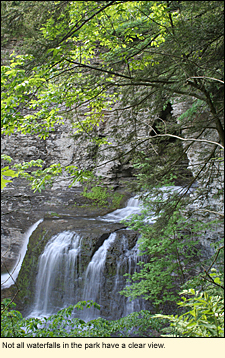 On the east side of lower Buttermilk is the Gorge Trail through a spectacular water-worn, wooded gorge with views of numerous falls. Photo opportunities abound. The Rim Trail on the west side of lower Buttermilk offers a more leisurely walk through a dry woods. There is also a nature trail--Larch Meadow Trail--which winds through a moist, shady glen and wetland. 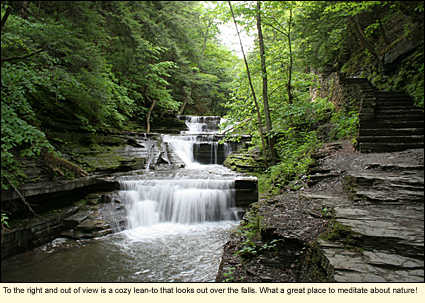 All told, the park has 10 waterfalls, 2 glens, and 5 trails. One could easily spend the good part of a day enjoying either part, but people who are fit and used to a lot of hiking will not find it difficult to hike the rigorous 4.5 mi./7.2 km. round trip from one end of the park to the other and back. Please make sure you wear proper hiking shoes on all the trails. 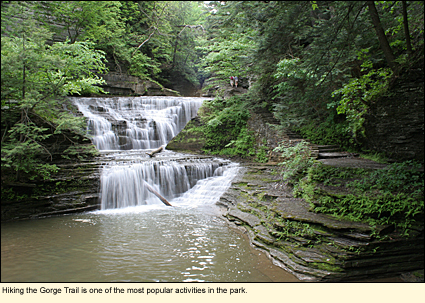 The Gorge Trail can be wet, muddy, and slippery. Trails can close at any time throughout the year, depending on the weather. Bicycles are not allowed on the trails. Swimming is allowed only at the bottom of the falls and only when a lifeguard is on duty. Cross-country skiing is a pleasant winter-time activity on the park road in upper Buttermilk, which isn't plowed in the winter. Park activities, including tours through Buttermilk Creek gorge, are offered weekly from July 4th through Labor Day (early September). The park is open year round. Camping is permitted only in the campground, which can accommodate both large and small groups. The campground is open from mid-May to mid-October. Pets must be leashed.